I finished up 2 books over the last week. The first was Lud-In-The-Mist by Hope Mirrless. 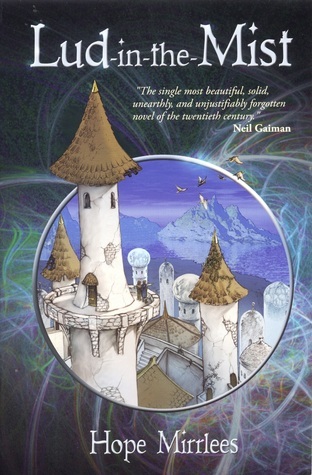 Book Summary: Lud-in-the-Mist, the capital city of the small country Dorimare, is a port at the conﬂuence of two rivers, the Dapple and the Dawl. 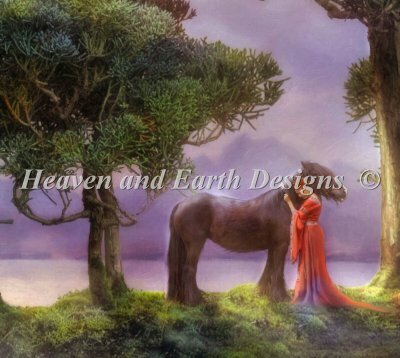 The Dapple has its origin beyond the Debatable Hills to the west of Lud-in-the-Mist, in Fairyland. In the days of Duke Aubrey, some centuries earlier, fairy things had been looked upon with reverence, and fairy fruit was brought down the Dapple and enjoyed by the people of Dorimare. But after Duke Aubrey had been expelled from Dorimare by the burghers, the eating of fairy fruit came to be regarded as a crime, and anything related to Fairyland was unspeakable. Now, when his son Ranulph is believed to have eaten fairy fruit, Nathaniel Chanticleer, the mayor of Lud-in-the-Mist, finds himself looking into old mysteries in order to save his son and the people of his city. My Review: I loved this little book. Beautifully written, lovely language and a story about the power of the love for your child (as well as yourself). There are echos of Tolkien in this book - things like the Bracegirdle's, and a bit of a Hobbiton feel to Dorimare. Another one recommended by my dad that I probably should have read years ago but am really glad I've read it now. Next up was A Book of Air and Shadows by Michael Gruber. Book Summary: An intellectual property lawyer is at the center of a deadly conspiracy and a chase to find a priceless treasure involving William Shakespeare. As he awaits a killer—or killers—unknown, Jake writes an account of the events that led to this deadly endgame, a frantic chase that began with a fire in an antiquarian bookstore. A distinguished Shakespearean scholar found tortured to death . . .
A lost manuscript and its secrets buried for centuries . . .
An encrypted map that leads to incalculable wealth . My Review: I wanted to like this book a lot. A historical mystery around finding old letters that tantalizingly lead to the possibility of a missing play by William Shakespeare sounded like a brilliant plot. Sadly, while this was an okay book, it wasn't a great one. It could have used an editor with a stronger pen for sure - by the middle third of the book, it was wallowing along in too much character development and digressing plot lines that didn't advance the story. 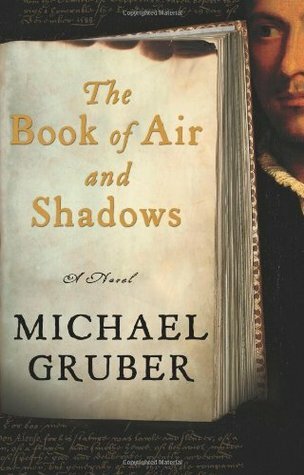 Probably a read for folks who like Dan Brown - it felt a lot like his writing, but for other folks looking for a great historical mystery, probably not. First, I finished stitching Believe, which is a Mill Hill Buttons and Beads kit. Super fun to stitch and I love the finished product. I replaced the perforated paper with a 14-count hand-dyed Aida in Balsam from Hand-Dyed Fabrics by Stephanie (which was part of a Stitchy Box from 2017). I also went ahead and finished it up with a "faux Xmas package" finish look this weekend. I love how it turned out and can't wait to display it over the holidays. And here's where I am currently. Still working on page 1, and while I thought I might be able to get a page finish this month, I don't think that'll actually happen in the next couple of days, so I'll hold that over until September. We are mostly thru week 2 of the Tour de Fleece, heading into the final days. (The Tour finishes up this year on July 29th). I finished up another spin, which is the 80/20 merino/silk roving from The Yarn Yard. I finally dug out the information on it and it was from a co-op-type fiber club where we had 6 different indie dyers sending out packages that shared a common theme for the 6 months. The theme for this one was "Scottish Fauna", and I do think it did a great job of portraying salmon, red deer, rainbow trout and heather. I spun up a 2-ply sportweight yarn with 294 yards/3.5 oz in the final skein. 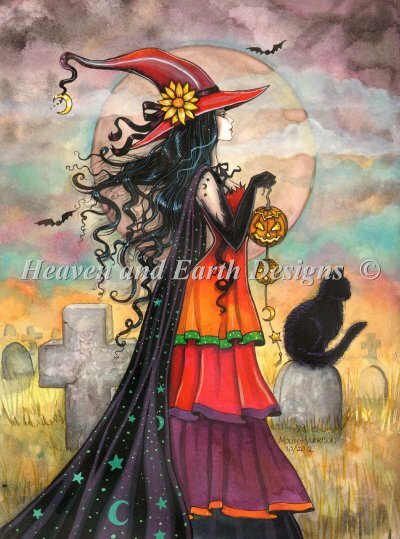 I love the fall-ish colors in this one and the hues are close enough, I think it almost works as a neutral. No specific plans (I'm a broken record with that, aren't I?) but one more out of unspun stash into yarn stash. Next up, I've put a Three Waters Farm SW merino/merino/silk blend on the wheel. The colorway for this is "Satisfied With Summer". Hoping to finish this before the end of July! This past week I finished up K.W. Jeter's Infernal Devices. This is for the week #32 topic - an alternate history book. Book Summary: He inherited a watchmaker's store and a heapful of trouble. But idle sometime-musician George has little talent for clockwork. And when a shadowy figure tries to steal an old device from the premises, George finds himself embroiled in a mystery of time travel, music and sexual intrigue. A genuine lost classic, a steampunk original whose time has come. My Rating/Summary: 3 1/2 out of 5 stars. This book was one of the first "steampunk" books written - and if Wikipedia is to be believed, KW Jeter is the writer who actually coined the phrase "steampunk". Steampunk: A genre of science fiction that has a historical setting and typically features steam-powered machinery rather than advanced technology. 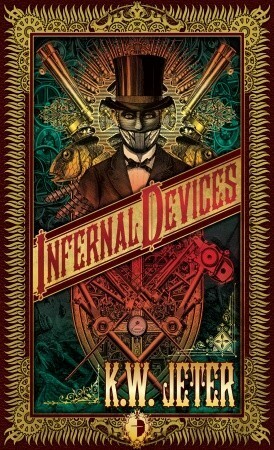 Interestingly enough, this book really doesn't have much in the way of steam-powered machinery. Instead, the concepts are focused around sort of seismic vibrations and clockwork. Both of which the main character is completely clueless about although he is thrust into an adventure that requires knowledge of both. I basically enjoyed this one - lots of clever (although maybe almost too clever) plot twists) and interesting characters who kept me guessing. Lots of adventures and romps across England and unlikely red herrings strewn throughout the book, so it was an entertaining read. I felt the ending maybe tied things up a bit to easily/quickly, but otherwise, if you like steampunkery, you'll probably like this one too. I'm pretty happy with my progress for the Tour so far this year! I've been trying to have a goal of 15 minutes of spinning a day, or 30 if I can make that happen. I finished up the Two If By Hand Polwarth roving, dyed in the "Calavera" colorway and LOVE how this one came out! I wound up with 204 yards of a super squishy 2-ply worsted weight; final skein was 4 oz. No specific plans for this one yet, but the little bright pops of jewel tones are so pretty. Next up, which I just started yesterday is a braid from deep deep stash. This was part of a co-op type dyer's club where a different dyer sent out a braid each month based on a "nature" theme. I can't remember what the inspiration for this one was, but it's 80/20 merino/silk and reminds me of fall leaves. This one went on the wheel yesterday, so not much in the way of progress to show yet. I am trying to get my active WIPs down to 12 by 2019. Good progress on that front, as I am down to 13 as of this week. I finished the stitching for the Mill Hill Buttons and Beads "Believe" Santa. It needs a press and to be fully finished, but I'm counting it as done. 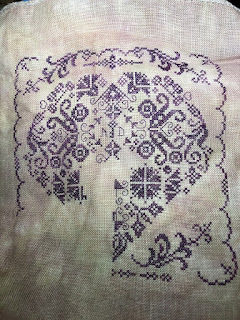 Super fun to stitch, but whew - a lot of work as it has tons of beads and is basically full coverage. I did switch out the perforated paper that came with the kit to put this on a 14-count hand-dyed Aida. I've got some blueish-green batik fabric to back this with. Undecided on a flat fold or a little pillow, but since I'm waiting on the fabric, I've got time to decide. Also got my The Winter Garden back from the framer and they did an amazing job - I absolutely LOVE how this one came out. The combo of that antique barn red mat with the slightly distressed, whitewash-looking frame absolutely delights me! I couldn't wait until the cold weather to display this, so it's out on my sideboard already. I'm going to work on this for the remainder of July or until I get this page done, whichever comes first. I'm looking forward to taking a bit of a break from monogamous stitching to participate in Arbitrary August. That'll be a randomly-generated WIP to work on each day in the month (minus a few days I'm on travel), so I'll be able to at least put a few stitches in multiple different pieces and should be a nice way to work towards my final goal of the year which is to touch all of my pieces at least once. Still on the fence about a new start for my birthday this month. I'm so close to reaching my magic number of 12 active WIPs, I sort of hate to bump that number up again - and since I've got a couple of weeks until my birthday, I 'm going to mull it over a while longer. My first spin for the Tour is another one out of stash. 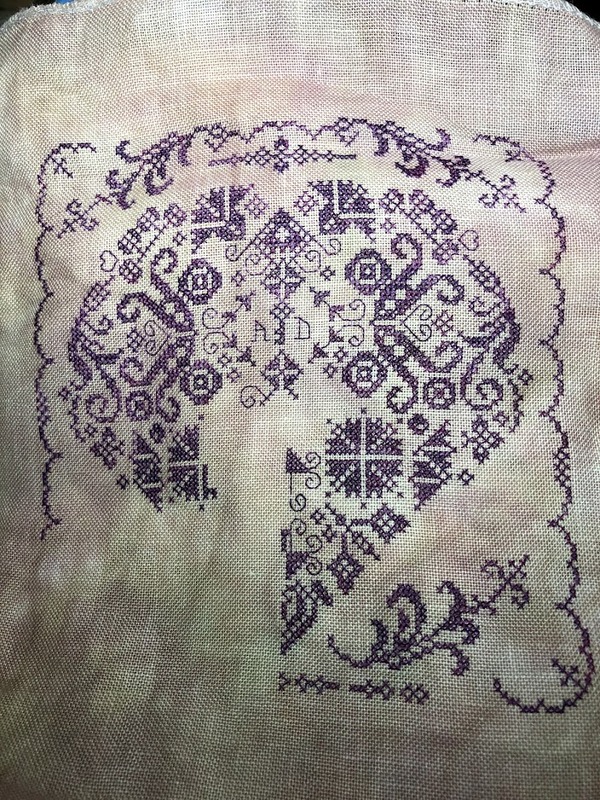 This is Calavera from Two If By Hand, on Polwarth wool. I decided I would try to get through a couple of braids in the next week or so at a DK-ish weight before I knuckle down and try to work on a thinner-grist spin. I've got 2 Two If By Hand braids earmarked for the heavier-weight items and I think I'm going to tackle a small amount of a 50/50 angora bunny/silk blend I've got as my lighter-weight yarn - but that is subject to change based on my schedule of things around here. I'm really looking forward to working on some more deep stash fibers for the Tour! I finished up another book this week. This one is for week 39, a book with a form of punctuation in the title: Dreamer's Pool by Juliet Marillier. My Review/Rating: 4 stars. Another one by this author I loved. I had actually read the second book in this series, and backtracked to this one which takes place before the other one I had read. I love how this author skillfully combines Celtic mythology and fairy tales, and breathes life into the characters set in this time period. 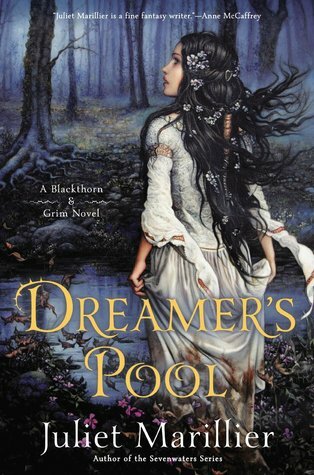 Her characters are beautifully created and one of my favorite tidbits is that she can so nicely slip back and forth between Blackthorn's voice and Grim's voice as the story unfolds. I loved having more of their back story, and the tale of Prince Oran and Lady Flidais is everything you'd want a classic fairy tale to be. A recommended read and I plan to pick up more of this author's work in the future. 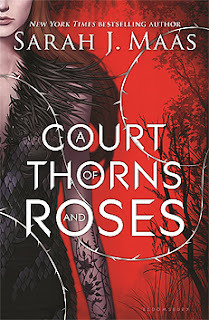 I finished up this book last week for my Around the World in 52 Books challenge: A Court of Thorns and Roses. My Rating/Review: 4 1/2 stars. I really enjoyed this book - I think would have enjoyed it even more if I hadn't read An Enchantment of Ravens more. They are similar in many ways - human female, Fairie courts who are brutal, and a bit of romance across the human/fairy boundaries. The main character in this is a great, strong female lead. There's a tiny bit of Katniss and The Hunger Games in there as well. I liked the plot twists - there's a lot going on and of course, quests of an epic nature. I think a very good read for the YA genre. I also liked the retelling/reshaping of the classic Beauty and the Beast concept. A few positive points taken off for my current pet peeve - a book within a series that leaves some unanswered questions, but overall, one I'd recommend if you like this sort of fantasy genre.